For the Wood Brothers and their crew chief Jeremy Bullins, this week’s trip to Martinsville Speedway is like returning to the home place for a family reunion. Both the Woods and Bullins consider Martinsville their home track, and their sponsor for the weekend, Virginia Tech, is from nearby Blacksburg. This weekend’s race is a first at Martinsville for the Virginia Tech athletic program, but the Woods have been competing at Martinsville since the 1950s. Bullins started out attending races there as a fan before beginning his career in NASCAR. The Woods make their familiar 28-mile trek to Martinsville down U.S 58 from their home in Stuart, Va., before turning onto U.S. 220 just south of the track. Bullins’ preferred route carries him over the backroads from his home just across the Virginia-North Carolina line in Walnut Cove before turning onto U.S. 220 at the state line. “Most of us come from short track backgrounds, and I guess I’ve been going to Martinsville since my dad would take me there at five or six years old. The home track feeling takes on a new meaning this weekend as the No. 21 Fusion will be adorned with burgundy and orange colors of the Hokies. Virginia Tech took its first ride on the No. 21 back in August at Bristol Motor Speedway. The paint scheme and the association with the Hokies were a hit in the garage and in the grandstands at Bristol. Team owner Eddie Wood said he’s proud to have Virginia Tech back on board for a race in the Commonwealth of Virginia. 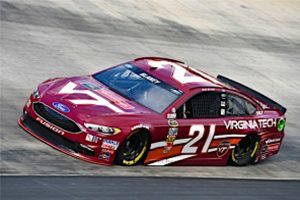 “It’s a real honor to be representing Virginia Tech, and it’s neat to be doing so at the home track for both of us,” he said, adding that he and the rest of the Wood Brothers crew are proud of the Hokies football team, which was 5-2 (3-1 in the ACC) heading into Thursday night’s game in Pittsburgh. Bullins said he’s looking for a strong run this weekend at Martinsville, where the tight, paper-clip-shaped track tends to confound many a driver, especially rookies. But Ryan Blaney fared better than most in his Martinsville debut, qualifying 12th and finishing 19th in the STP 500 back in April. “I know that experience will be big for us going into this weekend. He also did a remarkable job qualifying, making the final round. Qualifying for the Goody’s Fast Relief 500 is set for Friday at 4:40 p.m. and the race is scheduled to start just after 1 p.m. on Sunday with TV coverage on NBCSN.